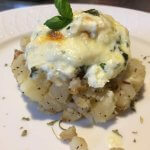 A simple but delicious savory egg dish. Start with a small ramekin, about the size of a piece of round Canadian bacon. You can put a drop of oil in the bottom of the ramekin, or simply place in the slice of Canadian bacon. Crack the egg in to the ramekin, on top of the bacon. Pop in an preheated oven at 425F for 12 minutes. Put potatoes in skillet, salt and pepper, then cover. Stir potatoes periodically for about 20 minutes. Place cooked potatoes on plate. Slide egg on bacon and place on potatoes.